I love durian! My favourite durian dessert is David Thompson's durian sticky rice that we ate in his Nahm restaurant in Bangkok. I have cooked my own version a few times and have been extremely happy with it. Its a polarising fruit that they say you either love or hate. As I have already said, I'm a lover not a hater. After a huge morning at the Footscray festival we returned home and all crashed out exhausted. When we finally woke we decided we should keep the gluttony going and get more treats for dessert. Dinner was more charcoal grilled chicken ribs as I still had some left from lunch the day before. But what for dessert? It was getting late and we were stuck for an idea that would do justice to such a fantastic day of eating. Then I remembered a post about a new ice cream place in Carlton called helados jauja that I had read on Mel: Hot or Not. I specifically remember that Mel mentioned that they have a few asian flavours coconut, black sesame and pandan. Tina checked the blog for details and jumped in the car to check it out. I was pretty hopeful but there was no way I was expecting her to return home with durian ice cream. Oh yeah! How could this day get even better? Yep, durian ice cream that's how. 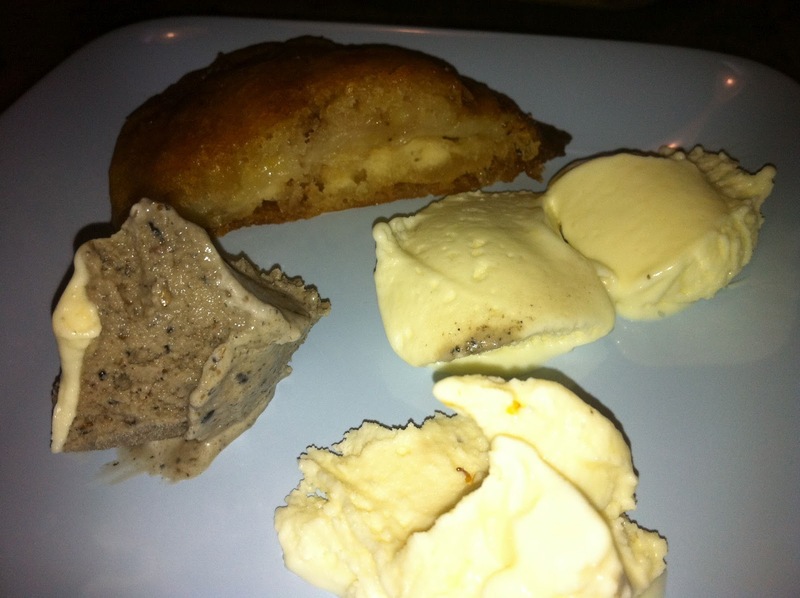 She also got some white sesame and black sesame ice cream to try and these were great but the durian was the star. There is no easy way to describe the taste of durian, you really just have to try it. The closest I can get to describing it is more to talk about the sensation of tasting it. I have written before about those special strong pungent yet addictively moreish flavours like oysters, blue cheese and a great funky pinot. Well obviously durian doesn't taste like oysters, cheese or pinot but the sensation is something similar. Does that help? probably not. You'll just have to go out and try it for yourself. I suggest starting with durian ice cream at helados jauja and then if you need another durian fix, head down the road to Pad Thai in Midtown Plaza and order a bowl of their durian sticky rice. At the back is the banana fritter from the Footscray Festival, what an great way to end an awesome day!